Ageing population is growing faster in EU. ICT can provide solutions for Active Ageing; however, the success of novel ICT solutions depends on the user perception of their efficacy to support toward health promotion and global wellness. In this context, the H2020 project NESTORE (Non-intrusive Empowering Solutions and Technologies for Older people to Retain Everyday life activity) will develop an innovative, multidimensional, personalised e-coaching system to support healthy ageing by: (1) Generating and sustaining motivation to take care of health; (2) Suggesting healthy nutrition and personalised physical and mental coaching, as well as social interaction, to prevent decline and preserve wellbeing. NESTORE started in September 2017 and will last three years. It involves 16 partners from 7 European countries. On behalf of the NESTORE Consortium. NESTORE is funded by the European Commission under the H2020 programme, GA769643. The authors wish to thank all the project partners for their contribution to the project. 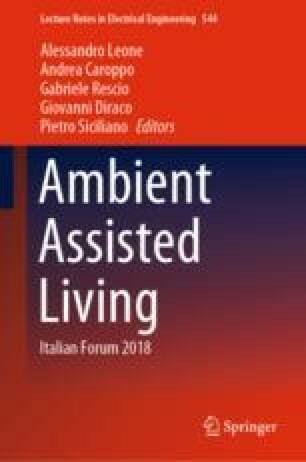 The authors want to thank the NESTORE Consortium and in particular: Leonardo Angelini, Elena Mugellini (University of Applied Sciences and Arts of Western Switzerland, Switzerland); Simone Porcelli, Filippo Palumbo, Michele Girolami (Consiglio Nazionale delle Ricerche, Italy); Christina Roecke (University of Zurich, Switzerland); Josep Del Bas, Silvia Orte, Sebastian Idelsohn, Filip Velickovski (Fundació Eurecat, Spain); Martin Sykora (Loughborough University, United Kingdom); Petia Radeva (University of Barcellona, Spain); Emanuele Lettieri, Paolo Bertelè (Politecnico di Milano, Italy); Antoni Salvà (Fundació Salut i Envelliment, Spain); Estelle Huchet (AGE, Belgium); Giuseppe Baroni, Corrado Galzio, (Flextronics Design Srl, Italy); Ciprian Candea, Gabriela Candea (ROPARDO Srl, Romania); Paul Chamberlein, Claire Craig (Sheffield Hallam University, United Kingdom), Stephan Lukosch (Technische Universiteit Delft, The Netherlands).